A 12-year-old boy who was apparently trying to drive across Australia has been stopped by police 1,300km (800 miles) into his journey. The boy was pulled over in Broken Hill in the New South Wales outback on Saturday after a patrol noticed the car's bumper dragging on the ground. 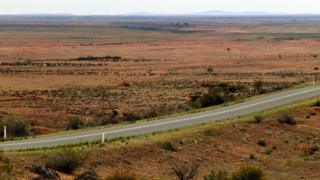 Police said the boy had been attempting to drive 4,000km from Kendall in NSW to Perth, Western Australia. He was arrested and taken to Broken Hill police station. His parents, who had reported him missing, picked him up on Sunday. The journey from Kendall to Broken Hill involves driving hundreds of kilometres along straight, sealed highways which pass through some of Australia's most productive farmland and the featureless plains of the outback. The whole route to Perth would have taken about 40 hours, if travelling non-stop. The manager of a petrol station in the town of Cobar was quoted as saying that he looked "maybe 19 or 20". Police also said the boy was "about six foot tall" (1.8m). "He'd taken the family car," Det Insp Kim Fehon told the Australian Associated Press. "His parents reported him missing immediately after he left home, so they were looking for him." A NSW Police spokesman told the BBC it was possible he could face charges under the Young Offenders Act.